March ushered in a new outreach season and just like Emily Dickinson’s poem heralding it “the month of expectation,” we were welcome visitors bringing color back to the dreary world of late winter blues. Our first outreach reminded us that we were wedged somewhere between winter and the official start of spring. An impressive turn-out of choir members had traveled by public transportation on as many as three or four trains to Split Rock Rehabilitation Center in the Bronx neighborhood of Baychester amidst the remnants of a late winter storm. The weather gods obliged to some extent when the inclement weather finally abated late Saturday morning signaling that it was time for us to sing. After all, we had been trying to secure this outreach for several years and our persistence finally paid off when Lis booked it. It was well worth the wait! Rene’s former student, Vivian Rivera, who is now a resident at the rehab center, was thrilled that we were finally able to sing at the center and it was truly a beautiful moment when Vivian and Lis performed a duet of Sull’ aria during the program. Six days later, we all had such a wonderful time on a sunny but chilly afternoon, singing at the Goddard Riverside Community Center. The smells of cooking drew us in, and as we entered, some of us wondered, "Was it seafood?” We all convened in the lobby area and Renè warmed us up a bit. We sang in their cafeteria surrounded by brightly colored artwork—some perhaps self-portraits, some abstract pieces, and some artwork that featured women in sunglasses with words representing opposing emotions on each of their lenses. There was a piano in the center of the room which Renè played throughout our outreach. We sang to a very enthusiastic crowd of about sixty seniors who loved our music, many visibly singing along. At the end of our outreach, our audience shouted, "Encore.” And we gave them what they wanted. We responded with a rousing impromptu "Let the Sun Shine in" which featured Johnny singing and running out into the audience, hugging a few ladies in the front row. Three guitarists accompany the choir on the song, Fragile, performed at Sundays at JASA. JASA stands for the Jewish Association Serving the Aging. 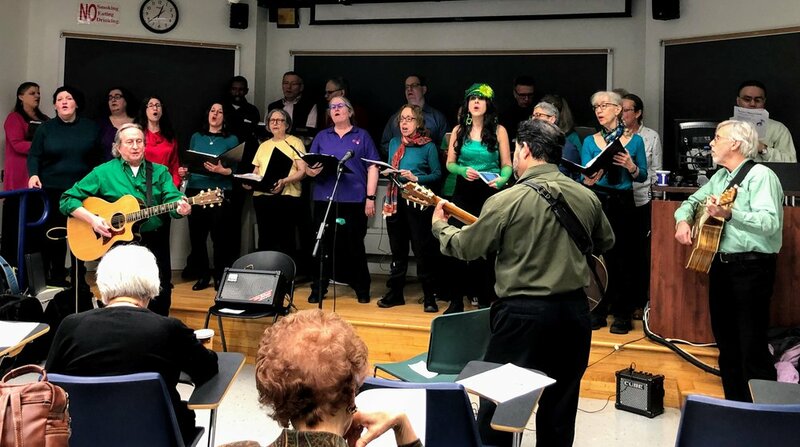 The month’s last marvelous outreach was at John Jay College on St. Patrick’s Day—thus, the smattering of green shirts here and there that you’ll notice in the photos. We provided the entertainment for the lunchtime Sundays at JASA program, a continuing education program for adults 55 years of age and older. 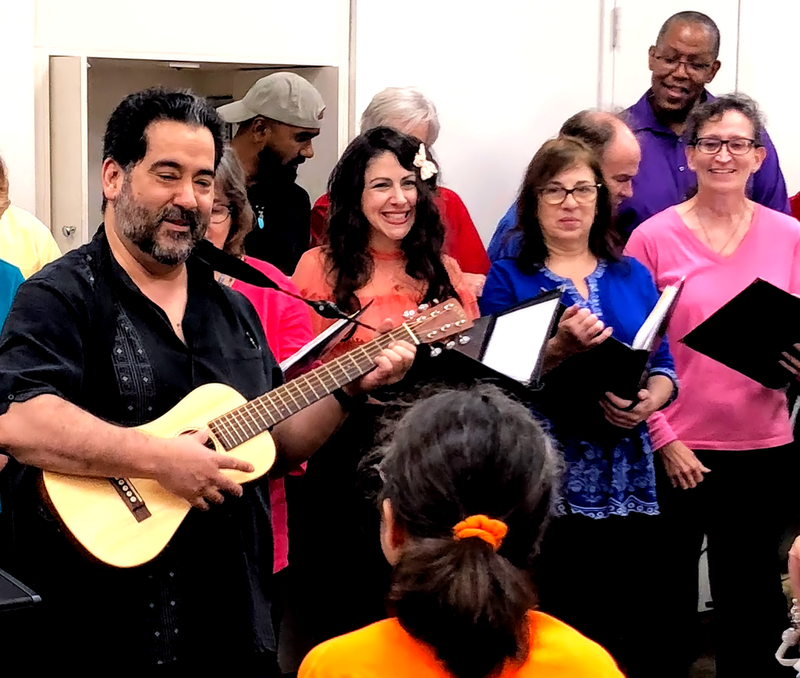 One of our biggest supporters, Norma introduced us amid much fanfare as the "one and only Peace of Heart Choir.” We sang on a stage in a classroom setting with blackboards at our backs as Renè, Andy, and Marv accompanied us on guitar throughout our concert. We had such a joyous time performing sing-alongs such as “This Land is Your Land,” “Singing for Our Lives,” and “Peace Like a River.” We did our special rendition of “Fragile” driven by Andy’s vocals and René and Andy on guitar with the choir singing the chorus refrain. 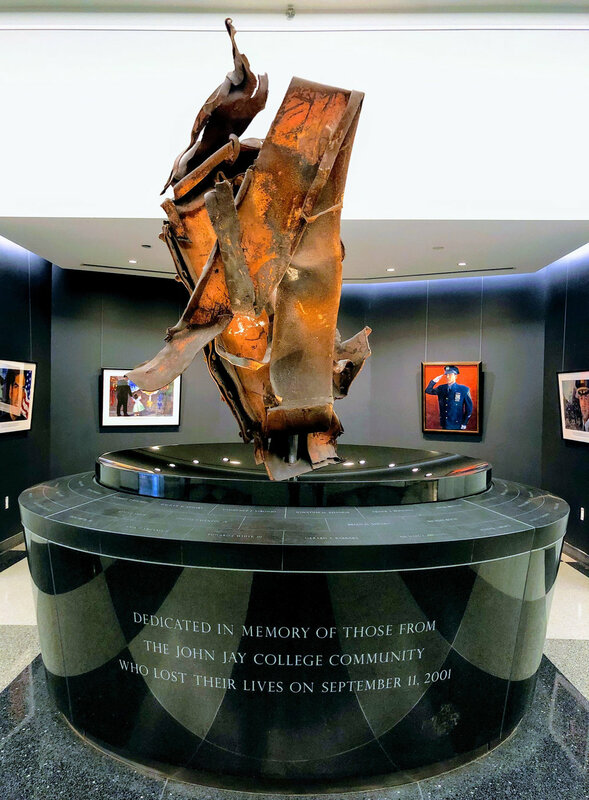 As I walked out, I noticed John Jay’s 9/11 Memorial Sculpture, the twisted steel beam that had once supported one of the towers of the World Trade Center until that fateful day which now bears the names of 67 people from the John Jay community who lost their lives on 9/11 etched on the granite’s outer pathway. I thought of our connection to 9/11—how Peace of Heart Choir was formed after the tragic events of that day to promote healing, diversity, and mutual understanding through music. And we continue to bring that healing through music nearly twenty years later. March indeed was a month of expectation blossoming with three wonderful outreaches and one delightful public performance on the Sing for Hope Performing Arts Stage at Port Authority. 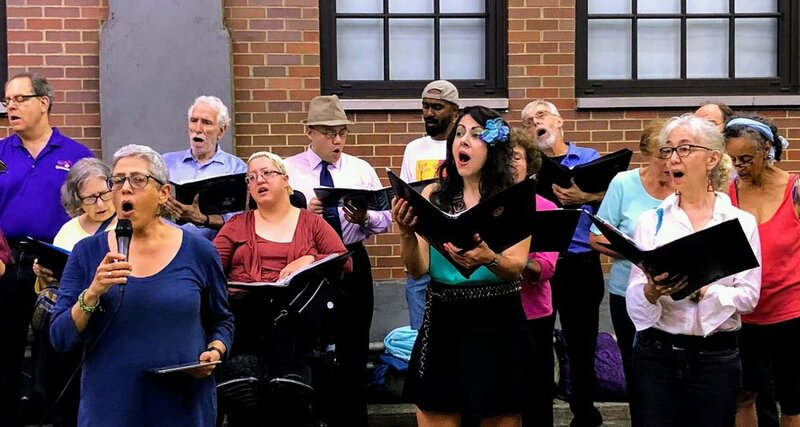 (For a more in-depth account of our public performance on the Sing for Hope Performing Arts Stage at Port Authority, here is the link to check out our blog post: “Port Authority Rush Hour Commuters Transported by Our Rainbow of Music”. After Brooke’s first outreach, she exclaimed, “I can’t wait for my next outreach!” I second that emotion. Spring has arrived with more outreaches in April at The New Jewish Home, Fountain House, and The New York State Veterans’ Home. Port Authority Bus Terminal during rush hour: scurrying commuters, patrolling National Guard soldiers, and on this Wednesday evening—the harmonious Peace of Heart Choir. Every Wednesday during rush hour on the Sing for Hope Performing Arts Stage just above the concourse level Au Bon Pain and wedged between steps and sets of escalators, the terminal is transformed by the sounds of music. Located on a platform that was once the terminal’s operations control center, the glass-enclosed stage seems tucked away at the very center of Port Authority, almost an entity unto itself that majestically rises up from the street level with its official Sing for Hope logos on the front of the glass, Sing for Hope banners as the backdrop and of course, front and center, the artist-designed Sing for Hope rainbow piano jazzed up in marvelously whimsical swirls of color that would make Pucci proud. Our Peace of Heart Choir banner was featured too--at the far-right corner. We gathered in a semicircle around the piano with Renè at the helm. There was an “only in Port Authority irony” when as we sang “Save the Country”, the flashing LED sign on the opposite mezzanine read “God Bless America” followed by a flashing message heralding “Quick and Easy Hair Removal”. But that’s just the flavor of the ever-moving New York City—what makes it so unique, rich, and full-of-life. There was some blood—Renè cut his thumb playing—with Nancy quickly coming to the rescue with a Band-Aid, maybe a little sweat under the stage lights which produced some interesting optical illusions at times—a small group of baritones standing together looked as if they were part of Blue Man Group. There were no tears though, unless someone listening was choked up by one of our songs which has happened before. There was a lot of joy as all of us sang, sharing our music with the audience. We were clapping enthusiastically and dancing during sing-alongs such as "Peace Like a River" and "This Little Light of Mine”. Some of us waved to commuters below as a greeting and an invitation to stay and watch the music which some of them did. Perhaps for one song, perhaps two, before moving along again. Lis had her own fan club--friends from Texas who had come to see her sing her solo in the Billy Joel classic “River of Dreams”. Gail and Renè both mused at the end “what did the audience get from it.” In a place like Port Authority, with people passing through you will likely never see again, you may never know. About 30 minutes later walking through the terminal, a Port Authority cleaning lady approached me to let me know that she had seen all of us sing earlier. She smiled enthusiastically, exclaiming how beautiful we sounded, how much she loved our music, how she had loved seeing us sing here two years ago, and how glad she was to see us again. She had remembered us, remembered our music and made sure she saw us when we came back. After a mutual expression of gratitude and a hug, we were back on our way. I walked back into the anonymity of Port Authority with a smile on my face. Ah, the power of music… Helping to make your time spent at Port Authority sound a whole lot better…. We’ve sung in public venues before, usually in places like the High Line, where people happen upon us as they stroll by. Today, the audience came specifically to hear us. In Lincoln Center. In an auditorium named for Bruno Walter. We all felt the awe of that. Backstage hummed, with Rob giving out POHC mugs, shirts, and totes, and Evelyn, our deportment guru, lining us up so we could practice walking onstage in formation, closed books in our left hands. The warm-up was long, more like a dress rehearsal, where, for the first time, we got to work on the transition between Mood Indigo and Satin Doll. Like cramming in the moments before a final exam. Amazingly, it worked. The NCJW has a sister senior center in Brooklyn that my mother was a member of for many years. She had lunch there, acted in plays, sang in the chorus, and brought her broken appliances to the retired fix-it man who set up shop in the lobby. The Council Center, as she called it, definitely lives up to the mission stated on its website: to address the social, intellectual, and creative needs of seniors. After our usual warmups—vocalizing and trying out bits of songs to synchronize guitar, mandolin, and ukulele—one of the early-bird audience members called out, “You sound beautiful.” Then, in the few minutes before the start of the concert, some of us walked through the audience giving out pamphlets to people who asked about auditions and the fundraiser. There was an old-home-week kind feeling: one woman knew Lenore and Bill from her church; another woman knew Anthony from YAI; and a man asked whether I was Marv’s sister (it turns out he had once come to a POHC rehearsal). We opened with “Siyhamba”—no surprise there—but this time it was “Siyhamba” with a twist. When we finished it, a woman in the back asked whether we ever tried to sing both languages at once. So Rene had half of us sing Zulu while the other half sung English, and it sounded pretty good. “You’re hired!” we told her. They liked the whole concert and really did look at the singalong sheets, because when it came time for “This Little Light of Mine,” they said the same thing our last audience said: “It’s not on the sheet.” No matter, they sang it anyway. Sixteen performers, and twelve audience members in a very small room. Chamber music. Up close and personal. Clyde Burton House, at the end of Alphabet City (between C-D, but feels more like Z when you’re walking there), has 33 SRO units of supportive, permanent housing for formerly homeless seniors or seniors with mental health issues. (A senior is someone over 55.) It’s one of the facilities run by the Bowery Residents Committee (BRC), and our own Soprano Olga does volunteer work there. The crafts her seniors made were hanging on the bulletin board. We warmed up by running through several numbers, mainly so the various stringed instruments (Rene’s, Brian’s, Marv’s) could coordinate. A few audience members were already seated during this time, and we explained that they would be hearing these songs again. One of the men said that was fine: “Y’all good at what you do, from what I heard.” One of the women sang along with “Pieces of the World,” even though there was no way she could have heard the song before. After Carrie introduced the choir, when we officially started with “Siyahamba,” she sang along with that, too. When I got home, before writing this, I looked at the BRC and clicked on a video called “Grace’s Story” (see below for link). It turned out to be the story of the woman who was singing “Siyahamba” and “Pieces of the World.” The subtitle of the video is “Every Homeless Person Has a Story. This is Grace’s.” It’s not often that we get to know the personal histories of the people we sing for. It adds another dimension to what we do. The Sisters of Mercy closed their Willoughby Avenue convent in 2008, after 146 years of ministering to the homeless, orphans, and the sick. The beautiful building now serves as the administrative office for Mercy Home, the order’s network of thirteen group homes for adults with developmental and intellectual disabilities. The building is also used as a community center, a place the residents come for recreation and enrichment programs. It was POHC’s privilege to be the recreation for this evening, both on the giving and receiving end. The door of our small warmup room was open, and people stopped by to introduce themselves and shake hands on their way to the former chapel, now the auditorium. Many of them knew Michael Anne, the POHC Soprano who works for Mercy Home and arranged this gig. When it was time to begin, we marched down the center aisle to the stage area in front, with people waving and smiling as we passed. Ruth introduced the choir, and then we opened with—you guessed it—“Siyahamba.” It’s always a hit, but this time, when it was over, someone shouted Encore! above the applause. Encores we did. Ten. By pre-arrangement, most were singalongs, with POHC members mingling with the very receptive audience during Rock-a-My Soul. The rest of our numbers were sung on stage, which we shared with one of the residents and his full set of drums. Occasionally he helped us keep the beat, but otherwise he just sat and listened. This audience was dressed up for an event, and they all had big smiles on their faces. They moved. They swayed. They Clapped. A few even stood up to bounce in place while we sang and Rene, Ruth, and Marv played—not all at once—two guitars, a mandolin, and a ukulele. Thanks to Wilfred and Deb for beautiful solos. After our closing “Let There Be Peace On Earth,” we got to sit in the audience and hear their band, The Melodic Souls. The drum guy on stage came to life, and so did a keyboard player and a guitar player. Other members of the band were in the first two rows of the audience, turned around to face the rest of the audience while they shook maracas and tambourines. Each member of the band was introduced by the drummer and got up to take a bow while the audience whooped and hollered. Then came an original song, “On Our Way Home,” and a standard, “I Can See Clearly Now.” One of the staff members passed a microphone around to give each of the band members a solo moment. Now it was our turn to clap. Tonight, we did, indeed, sing joy. Furaha! "A Season to Shine": At a Benefit Concert for the first time! Our annual Benefit Concert, "A Season to Shine" was finally here, At the "Baruch Performing Arts Center" we were expected to appear, Excited alike were the veteran and new members, This would be a performance to remember! The day began with an early call time, Everyone carrying baked treats and looking just fine! Michael Anne, Olga T. & Noella were stunning in Red, Alex, Gary and Phil dressed in Blue the tenors led. In the alto section Carrie sparkled and shined, And René topped it all with an Orange sublime! The first task was a general rehearsal. How should we stand? You'll be there, I'll be here, everyone hold your music with your left hand! We went through the repertoire tuning our voices and refining our part, With René's final adjustments, soon it was time for the concert to start. We headed to the backstage excited and eager to begin, And while we waited Bass Barry Started to sing, "It had to be you" he ingeniously improvised for us newbies, And Deb with "Certificates of Achievement" made us all shine like rubies, Maryann and Laura S. were never absent at rehearsals this season, so for celebrating there was more than one reason. Attention please, It's time to line up! Rob called out, chaos broke loose, the right place in the line was for everyone a huge doubt, after fumbling a little and giggling a lot, We were finally ready, everyone in their spot. So we walked on stage, the lights shone bright Seeing our friends and family was a delight, (and soooo many people gave us a bit of stage fright). "Furaha!" We sang first, wishing joy for each and every day, And so the concert was well on its way. "Carol of the Bells" was a favorite for many of us, So excited to sing it we took off a bit rushed. René made no fuss, He led us to the last notes, “Ding Dong Ding Dong”, That was a wonderful song! Next the lovely Lily invited the audience to join in, For the Yiddish tongue twisting "Ciri biri biri bim", We all concentrated to come in on cue, It turned out just right, a sigh of relief we all blew. Then Pearl introduced "Gentrai", the beautiful Irish song, and we knew our sopranos couldn't go wrong, Seconds together with altos as Uilleann pipes hummed, And with intricate lyrics the first sopranos were then summed. Next Carol King's "You've got a friend", The audience enjoyed from beginning to end. Laura Wells and Charlie blew me away with their heartfelt duet, And Evelyn's violin was so special it will be hard to forget. The Bass and Tenors were the highlight of the "Kwanzaa Song", "Continuous, continuous" they all sang along, Then the time came to "Light one candle" And even though I had a few doubts, with the help of my fellow seconds it was easy to handle! The intermission arrived in a flash, And off for our treats the audience made a dash, The Bourbon brownies I hear were a must, They sold out so quickly nothing was left, not even a crust. The second part began with "Sleigh Ride", the bells started ringing, And to a fast tempo we were tightly clinging, Rene led the horses with a clip and a clop, Carrie had practiced "the slap" all night. That's why the "special effects" were the song's highlight! The time came for "That Lonesome Road", And in her solo our dear Nancy her talents showed, She wowed the audience with her vibrant jazzy voice, For this song she was the perfect choice! Then it was time to dance with "The Boys", "Oye Como Va" let's make some noise, Barbara in percussion and Marv's flute, To the great Tito Puente we payed tribute. The room was suddenly quiet when Dave began to play, His "Holiday Medley Guitar Solo", blew the audience away, It set the perfect festive atmosphere, I felt honored to have such a talented peer! Our 4 Lennons came on stage for "Happy Xmas (War is over)", Of course I mean: Brian, Andrea, Gary and Tony Glover, They gave a unique feel to a traditional tune, There won't be a cooler quartet anytime soon. Anthony put on his shades, he knew it was time to have fun, "Proud Mary" was next, “nice and rough” was how it had to be done, I had always dreamed of singing it one day, And with Tony's improv. we put on quite a display. The repertoire included some sing alongs, “Rock-a my Soul” and “Michael Row the Boat Ashore”, I was happy to see our board members singing and dancing galore, Last but not least, with "Let there Be Peace on Earth" the concert was coming to an end, And for this one, with the past alumni we made a perfect blend. I felt so lucky to be part of such a diverse and wonderful crowd, We looked at each other and gracefully bowed, I never thought so many friends I would acquire, Thank you for being so awesome "Peace of Heart Choir". I looked for the entrance of Workmen’s Circle Multicare Center. Its turquoise pillars stood out in this residential Bronx neighborhood on a dismal December day and I knew I had found the right place. Workmen’s Circle Multi-Care Center is a 525-bed non-profit rehabilitation center/nursing home. I walked through the front doors and I told someone at the front desk that I was with Peace of Heart Choir and asked where we were rehearsing. He directed me to a room directly across from the desk where I found Rene and several other choir members waiting for guidance as to where we would go next. Apparently, they were not aware we would be performing. But that it is possible on a weekend performance such as this when the director was not there. I joked to fellow choir members we were being sequestered as the glass door was closed, the space was tight, and it was very warm—even warmer than the nursing home itself which is always warm as a rule of thumb. A lady who was a manager came by and rescued us and brought us upstairs to a chapel where we left our belongings and it was time for the outreach to begin. We lined up and I took notice of the room. A Sunday meal menu for breakfast, lunch, and dinner was posted on the wall with a photo of Liberace at the very top. I joked to Howard, “It appears that Liberace presides over the Sunday meal.” Howard laughed. I then noticed the poster of a record that read “Rock and Roll” across it. If you looked to your left, you could see you were in a hospital/nursing home setting. When you looked in the direction of the dining hall, it felt like a combination dining hall/classroom with all of its decorations—a place almost stuck in time meant to probably evoke nostalgia with its posters of Elvis Presley, Willie Nelson, and Liberace as I mentioned before—just to name a few. Rene warned us before we entered of the frail state of the people in attendance. I was prepared for it as I was so familiar with my Dad’s frailty at the end of his life 5 years ago after a battle with lung cancer. Many residents were in wheelchairs and had breathing tubes. We took our places and it was time for the outreach to begin. From our opening number, Siyahamba, it was evident we had a fan in the front row. She had a breathing tube and was in a wheelchair and she was just as bold and spirited as her red lipstick and the bright red beads she wore around her neck. She was pounding her right fist in the air in response to our music. At the end of the song, in a raspy voice, Jeanette shouted, “Excellent.” We continued with a lovely Wanemo to which Jeanette exclaimed, “Beautiful.” It was also clear we had another fan. He was in a wheelchair on the opposite side in the front row. He wore a drag racing cap and seemed to be a native New Yorker and was very assertive in his approval. A festive Carol of the Bells was next followed by Michael Row the Boat Ashore. There was a lady sitting at the left hand side of the room in the corner. I made eye contact with her a few times. It was during Michael Row Your Boat Ashore, she seemed to become more involved in the outreach. Her eyes lit up. During Down by the Riverside, we went out to shake the hands of the residents which I found really moving and I know my choirmates found especially touching as well. When I shook the hand of the lady who became involved during Michael Row Your Boat Ashore, she revealed a most gracious and gentle smile as she mouthed, “Beautiful” to me and she said softly, “My throat is sore. I wish I could sing.” That Lonesome Road featured a heartfelt, lovely solo by Nancy. Oye Come Va was a great fun, up tempo number. A pretty Pokarekare Ana, our Maori love ballad and a pensive Light One Candle followed. Next was Happy Xmas(War is Over). I’m so glad that Deb suggested we reinstate the choral refrain War is Over. I know many other choir members have commented what a difference that makes in preserving the integrity of the original meaning of the song as written by John Lennon and Yoko Ono. And what a wonderful vocal quartet we had for this song: Brian, Gail, Gary, and Maryann. Our number one fan, Jeanette, especially appreciated this tune as did several audience members. Rock-a-My-Soul was next followed by our wonderful anthem for our children, Give Us Hope and our signature anthem, Let There Be Peace on Earth. Exemplary musical accompaniment was provided throughout the outreach by Brian and Marv on guitar and Rene on ukelele/cigar box guitar as it was affectionately referenced. Deb, Barbara, and Ellen also provided fine musical support. We carpooled back to Manhattan and Queens, respectively. It had been a touching outreach—the last outreach of the season. I thought of when I shook Jeanette’s hand during Down by the Riverside. She said, “Bless You.” I felt blessed to have met her and to have been a part of this Peace of Heart Choir outreach. Blessed indeed.